We have 2 styles of reconditioning kits and either will fit the Chameleon, T2 or T1 brace. These reconditioning kits will restore your old Active Ankle to near new state. 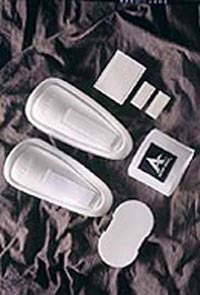 Includes velcro strap, heel plate, lateral E.V.A. cushion and medial E.V.A. cushion. Please note that when using a kit designed for a different model brace (eg. putting a Chameleon kit on a T2 brace) some items may need minor modification. In most cases it's best to simply purchase the original kit for your brace...but if you have a specific need (or desire) to change then it is advisable to call us first for advice to ensure you can get the desired result.